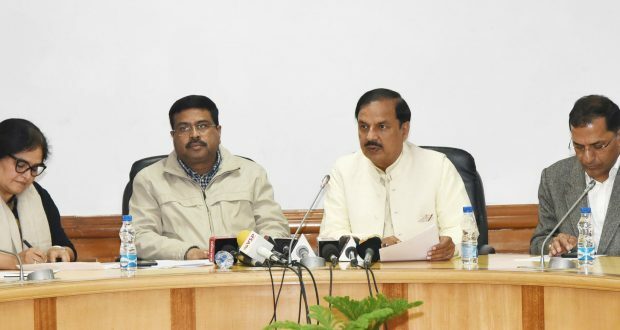 The Union Minister for Petroleum & Natural Gas and Skill Development & Entrepreneurship, Shri Dharmendra Pradhan and the Minister of State for Culture (I/C) and Environment, Forest & Climate Change, Dr. Mahesh Sharma at a Joint Press Conference on Prime Ministers Odisha Visit, in New Delhi on December 20, 2018. The Secretary, Ministry of Culture, Shri Arun Goel and the DG, Archaeological Survey of India (ASI), Ms. Usha Sharma are also seen. Newdelhi:20/12/18;The Minister of State for Culture(I/c) Dr. Mahesh Sharma and Minister of Petroleum & Natural Gas, Shri Dharmendra Pradhan today held a Joint Press conference to brief about the upcoming visit by the Prime Minister, Shri Narendra Modi to Bhubaneswar on 24th December 2018 and events lined up to commemorate Paika Rebellion. Addressing the Press Conference, Dr. Mahesh Sharma said that the Prime Minister will release the commemorative coin and postage stamp in memory of Paika Rebellion on 24.12.2018 in a function to be held in IIT Bhubaneswar campus. He also said that the Government of India has decided to set up a chair in the memory of the event in Utkal University, Bhubaneswar at a cost of Rs. 5.0 crore. The money will be released to the University as corpus fund to be kept in Escrow account. Expenses of the chair will be met out of the interest earned on the corpus fund, he added. The Culture minister also informed that the Prime Minister will also be inaugurating the Archaeological Museum, Lalitgiri which will surely add a new facet of tourism in the region and increase the immense potential of employment generation. Thanking the Ministry of Culture for recognising the Paika Rebellion at the national level, Shri Dharmendra Pradhan said that in 1817, forty years before the revolt of 1857, Buxi Jagabandhu roused his brave Paika warriors against the oppressive British Raj in Khordha and led them into battle. It was moment of pride for Odias all across the world when the current government decided to give Paika its place of pride. The decision to appropriately commemorate the bi-centenary of the revolution was announced in the 2017-18 Budget Speech. Briefing the media about the Museum to be inaugurated, DG ASI, Smt Usha Sharma said that in the larger public interest to boost tourism, as per policy of Site Museums, Archaeological Survey of India has constructed the Site Museum at Lalitgiri for display and protection of retrieved antiquities. The museum building has been constructed through CPWD by incurring an expenditure of Rs.10 crores. The whole complex is spread across an area of 4750 sq. m. The museum has been organized into six galleries with display of antiquities, etc. at a cost of Rs.86 lacs. Huge sculptures of the Buddha and various Buddhist deities, architectural fragments of Viharas and Chaityas are arranged period-wise across six galleries. The most important finding of the Lalitgiri are relic caskets found inside the stupa during excavations in the year 1985. Three Khondalite stone caskets were found out of which two have one set of steatite, silver and gold caskets each with the relics inside in the form of charred bones. Lalitgiri is one of the earliest Buddhist settlements in Odisha situated about 120 km north of Bhubaneswar in District Cuttack.